Wheat is looking to be an attractive trade. I may look at opening a small position over the next couple of days. Commodities eliminate the risk around a company going bankrupt etc. Also, food, will never go out of fashion. I would have liked more volatility and the constant down trend could make trading around this position difficult for a while. On the other hand, should the trend change direction, there may be a prolonged upward trend which would be nice. The ‘futures’ contract shows more up/down volatility, which makes me think that the trend may be in part a function of the instrument [ETF] rather than a pure function of wheat itself. Therefore I’ll look at it for a few days and see whether the ETF correlates to the futures contract in any meaningful way. If not, then as a trade, it probably won’t work that well. * Having just checked more closely, the ETF mirrors the futures contract, so no issues there. The initial market reaction to the actual outcome of the very competitive first round should be positive for risk assets and the euro, though not necessarily ebullient. The extent of the rally depends on what the final numbers say about the strength of Le Pen’s showing, especially now that both Fillon and Benoit Hamon, the Socialist Party candidate who was badly defeated, have rushed to throw their support behind Macron for the May 7 runoff. Looking ahead, and based on the widespread conventional view that a majority of the French electorate will again seek to vote for any alternative to the National Front, most market participants will likely assume that, when push comes to shove, Macron will be elected president — even though he lacks a political party and now faces the prospect of being pressed much harder on policy positions and past actions. So Le Pen comes a close second and markets are writing her off? The extreme vote that Fillon and Hamon received will now likely go to Le Pen. That could be enough in a 2 horse race to see her over the line. Another terrorist attack……more votes her way. This thing is far from over and I would prepare for a Le Pen victory. Brexit and Trump could never happen……and yet, here we are. So who is likely to win one of the two run-off spots? Well, let’s take a quick look at the field. The current front-runner by just a hair (at 24%) is Emmanuel Macron, a young, smooth-tongued, hyper-educated (Sciences Po and ENA) technocrat who was once Hollande’s economic minister but has never himself held elective office. His newly invented centrist party, En Marche!, is designed to please all sides. He believes in complex market reforms to make government work better. He loves Merkel’s open immigration party and firmly believes in the future of the EU. He is, deliciously, a total outsider that total insiders can feel comfortable voting for. Whatever Marine Le Pen likes, he finds offensive. He is especially popular among the urban and the educated. Trailing Macron by a hair is Le Pen herself–who will almost certainly repeat her father’s feat (considered astounding back in 2002) of qualifying for the second round. She is of course “Madame Frexit”: resolutely populist, anti-immigrant, anti-globalist, anti-Euro, and anti-EU. In recent months, the very possibility of her presidency (she has explicitly promised to redenominate some or all government debt in Francs) has widened the credit spread between Bunds and OATs. Her supporters are disproportionately rural, lower income–and young. According to one recent survey, 40% of 18- to 24-year-olds support Le Pen, nearly twice the share supporting Macron. Youth support for Eurosceptic political movements is in fact the rule in continental Europe (and has been critical where these movements have triumphed, as in Poland and Hungary). Unlike the youth in America or the U.K., the youth in France are desperate–and see no future in the status quo. Hovering in and out of third place is Jean-Luc Mélenchon (at around 19%). Mélenchon, a career politician transformed into a left-wing populist firebrand, has risen swiftly in the polls in recent weeks. As he has become more popular, he has been trying hard to walk back his more incendiary proposals (like 100% tax rates on high earners) to improve his mainstream appeal. But his defiantly anti-establishment message–he calls his movement “La France insoumise” (or “unyielding France”)–actually competes with Le Pen’s emotional space. Like Le Pen, Melenchon wants to “renegotiate” France’s “submissive” relationship with the EU and possibly even pull out. So while Le Pen bashed the unloved EU from the right, Mélenchon bashes it from the left. François Fillon (also around 19%), hammered over the last couple of months for a scandal involving large public payroll payments to his family in return for no work (he was of course shocked–shocked–to find this happening! ), is still hanging in there in the polls. He is the favorite among the socially conservative pro-business bourgeoisie. He remains the only real hope that an establishment party candidate might win. Yet Fillon’s program is anything but conventional: He advocates radical tax- and spend- and regulation-cutting reforms that critics not unfairly describe as “Thatcherism” (definitely not a complement in France). So here again an irony: The mainstream “Republican” candidate is prescribing the most revolutionary package of actual policy changes of any candidate. The fifth candidate, Benoît Hamon, is representing the utopian left wing of the Socialist Party after defeating the more pragmatic Manuel Valls in the primary. Squeezed from the left by the outsider Mélenchon, Hamon has no realistic chance. In France, as in most of Europe, the Social Democratic mainstream is rapidly downsizing. If ex-Socialist Macron wins, the Socialist Party in France may disintegrate entirely. Generational membership? It’s a young group. Melenchon (age 65) is the oldest. You can think of him as the left-wing Bernie Sanders of the bunch, though in fact he is ten years younger than Bernie. He and Fillon (age 63) round out the Boomers. Then you have two Gen-Xers: Hamon (age 49) and Le Pen (age 48). And finally there’s Macron, who (at age 39) is getting close to Millennial territory. The less-than-alarming market reaction to the election outcome (no big recent drop-off in EUR or CAC) is predicated on a dominant narrative that the financial media are peddling as gospel. The experts tell us, first, that Macron seems certain to be one of the two winners in the first round; and two, that Macron will win one-on-one against any hypothetical opponent in the second round by a fairly large margin. Sounds logical, right? He’s the mushy “center.” So by default he triumphs over any single opponent who’s not in the center. Et Voilà, France remains a loyal cornerstone of the EU and nothing much changes. What this means is that no one knows which two candidates will make the cut. For those who are betting on a bullish market reaction–in other words, a “relief rally”–perhaps the best outcome is either Macron-Le Pen (the current consensus prediction) or Macron-Fillon. But consider some more disruptive possibilities, such as those in which Macron does not make the cut. What about Le Pen-Fillon? 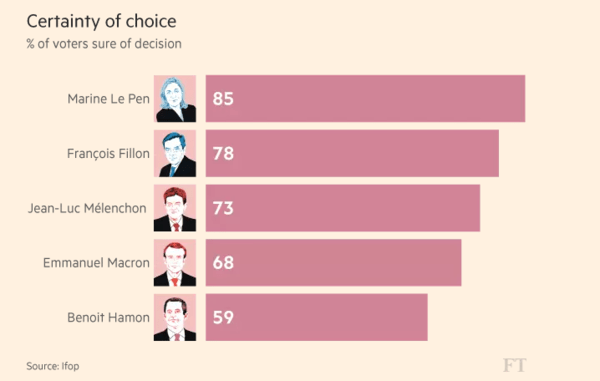 Most disruptive of all, what about Le Pen-Mélenchon–an outcome in which both candidates are threatening to pull out of the EU? That would trigger a huge sell off. Even if–as expected–it is Macron and Le Pen who make the cut, the second round may not be the sure victory for Macron that everyone is assuming. According to Serge Galam, the French scientist and complexity theoriest who predicted Trump would win last fall, the rise of “dégagisme” (literally disengagement-ism) among the uncommitted voters could actually allow Le Pen to beat Macron. And the share of uncertain and abstaining voters will certainly rise much further in the second round, when they no longer get to vote their first choice. If enough voters “voter blanc” (translation: vote “none of the above”) rather than vote for Macron, Galam believes either le Pen or FIllon has an opening. So don’t be complacent. Tectonic shifts are underway in France. Is there the prospect of the new Sixth Republic? C’est vraiment possible.